We decided to escape colder weather in Chicagoland by traveling to Albuquerque, New Mexico in October. But it was colder than at home. 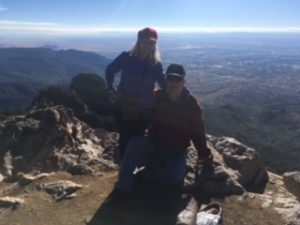 Finally warmer weather and sunshine made its way and we took a tram to the top on the Sandia mountains within the Cibola National Forest. The boy running our tram had been on the job for about a month. He had penetrating blue eyes and a pierced nose and ears adorned with various sparkling piercings that sparkled in the afternoon sunlight. I asked him if this meant he was able to snowboard in the coming winter for free. “Yes,”he said. “How do you get a job like this?” I said. Well, you have to be able to get on the top of the tram which is 10,678 ft high in case there is a problem or the need for an adjustment. “Yikes, that sounds scary,” I said. “Many who try getting up there just freak out and that ends the application process.” he said. I thanked him for sharing detailed information about the mountain and handed him a small tip for doing a good job getting us safely up and down the mountain. It was a breathtaking site. Our stomachs were growling and I saw an ad in a magazine for “Happy Hour” at a nearby restaurant. I was interested in the free food so I talked Larry into driving to Nob Hill restaurant near the University of New Mexico. But we missed the “Happy Hour”by two minutes. We had passed many ethic restaurants and decided on Ramen. It was full but they said we could probably get seated in 15 minutes; but after 40 minutes of waiting, we talked about leaving. The young man next to us noticed my husband’s retired Navy hat and he said,”Thank you for your service. You can go ahead of our party. We are just hanging out visiting, anyway.” I found out that Miguel was in the police academy ready to graduate soon. After 8’o’clock, we finishing eating our delicious healthy meal and asked our waitress for our bill. She said,”There is no charge. Someone else has paid your bill.” I knew it had to be Miguel. I told him how touched I was with his generosity and that I would make it a point to pray for his safely as a police officer and that God would bless his life. There were many young people at Ramen. Meeting Miguel and his friends made us realize that the future is in good hands. Previous PostMy Precious/LostNext PostWhat Shall I do When I Retire?